Copper tube made by measurements of the customer, from 3 to 60 mm side, even for small quantities. Production, on customers’ drawings and samples, of charge transformers and adapters in medium and high frequency into resin from 100 to 5000 KVA with windings and magnet core cooling baffles in copper pipes for the water-circulation-cooling. 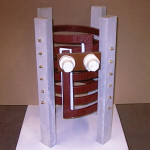 Production of three phase transformer for furnaces application, developed with secondary windings in copper pipes for the water-circulation-cooling in high currents. Production of measure transformers of medium frequency 0.35-10 KHz with a power of 60 VA (V1=100 V V2=400-450-500-600-800-1000V). Special transformers are produced on demand. Production of one phase reactance in copper pipes or copper twin leads. 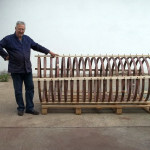 Production of copper pipes and copper twin leads from customer projects and samples. During our many lasting year activity we produced several kind of Reactance, Transformers ad new Adapter but also numerous reparations for our Italian customers.